With Fast Sleep the waiting in the airports are much more comfortable! 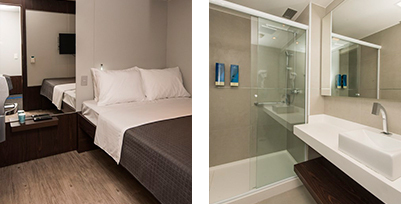 At Fast Sleep resting and showering are a part of a new and inovator guest service inside de airport. 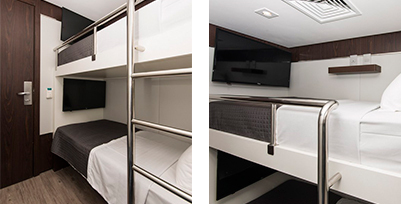 We offer our guests comfortable cabins with bunk bed, bathroom, TV and internet, so they can rest while waiting for their flights. The hallways and common areas are monitored by cameras and a modern fire alarm system interconnected to Infraero, ensuring their safety and tranquility during the stay in our units. 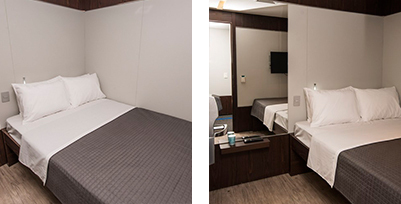 The cabins can be booked by hour or period according to the necessity. You can also use just the bathroom without booking the cabin. Please contact our customer service by phone: +55 (11) 2445-2356 or click here to request a reservation. Since its inauguration in 1981, in Curitiba, Slaviero hotels did not stop growing: today there are more than 20 hotels in five states. But even with fast grow, one thing has never changed: we always do everything to make your stay a unique experience. For us, hospitality is taken seriously.